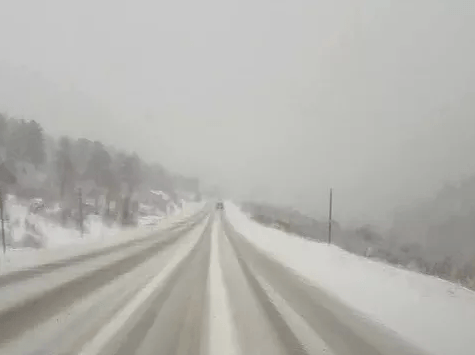 It’s full on winter conditions out there and the pass is a mess. I think people forget how to drive in the snow over the summer months. The first snowfall tends to bring a little chaos on the roads every year. The commercial chain law is currently in effect. For individual drivers, be sure you abide by traction laws when in place. The rule of thumb is to have 1/8″ tread on snow or mud tires on 2-wheel drive vehicles. For all wheel or 4-wheel vehicles, you should also have a minimum of 1/8″ on all tires. The other option is to have chains or an alternate traction device on your vehicle. An easy way to determine the depth of your tread is to use a quarter. Turn it upside down and insert it into the tred of your tires. If the top of his head disappears into the tred of the tire, you are good to go. If it does not, it’s time to replace those tires. Now is also a good time to stock your car with a first aid kit, warm blankets or sleeping bags, extra warm clothes, dry foods, scraper, shovel, tow strap, tire chains, jumper cables, lighter/matches, spare keys, etc.